Last year Groundspeak announced their new API. It has more features then the old one, but is is completely different. This meant a lot of work to rewrite big pieces of code to make iCaching work with the new API (did I mention that it was a lot of work?). For now the features are equal to the existing version, but a lot of the communication is faster than before. It will work for a month, and you can run it next to your current version. Please let me know if something does not work as expected via the Support web page (mention ‘beta’ in the subject). If the app crashes, please copy the crash report into the message so that I can interpret the crash and fix the code. Yeah, today is macOS Mojave day! In case you are wondering: yes, iCaching runs fine on Mojave. And with the upcoming release (and I have good hopes that will be very soon), it will also shine in the gorgeous dark mode. And there is one more thing…. Yesterday iCaching 7.0 was released! 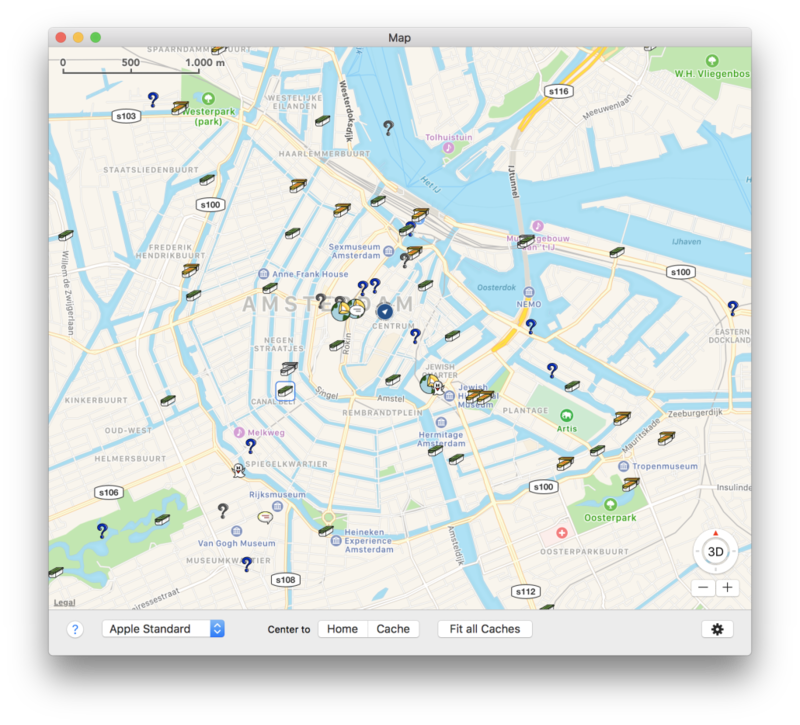 Improved Map experience by adding clustering of geocaches when they are overlapping each other. (btw this feature can be toggled on and off in the view-settings of the map). 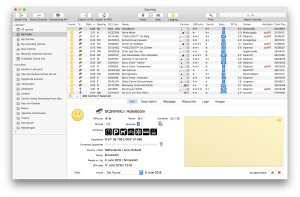 Cleanup functions for the library; simply purge old geocaches and logs. 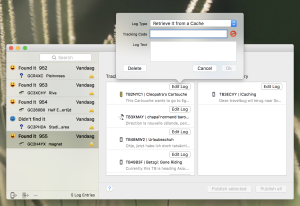 Enjoy this new version, happy (i)caching! Op zaterdag 11 November 2017 is het OFZE2017 Mega Event. In de middag zal ik daar een (nederlandstalige) workshop over iCaching geven. Ik zie er naar uit gebruikers van mijn programma te ontmoeten, tips en trucks te vertellen en natuurlijk ook graag feedback te krijgen op het programma. Voor de workshop moet je je aanmelden op de website van het event. Update: kuddos to Groundspeak, they reversed the change that broke the import. Should be working fine again. Unfortunately something seems to be changed on Groundspeaks side of the API. Now most API imports make iCaching crash. I was notified about this by several users (thanks for that!). I’ve made a hot fix and will submit that as soon as possible to the App Store. For now, the only workaround is to import old-fashioned GPX files. Unfortunately there are reports coming in about problems with the Map in iCaching. Apparently Google changed something on their servers that makes the map sometimes not appear. Users tell me that it spontaneously starts and stops working. Because this is an issue on their side, I can’t solve it right now. But at the moment I’m rushing to replace the Google Maps with Apple Maps which doesn’t have this issue. And moreover, the map will be faster and behave more smooth when zooming, panning etc. And it will have more features. 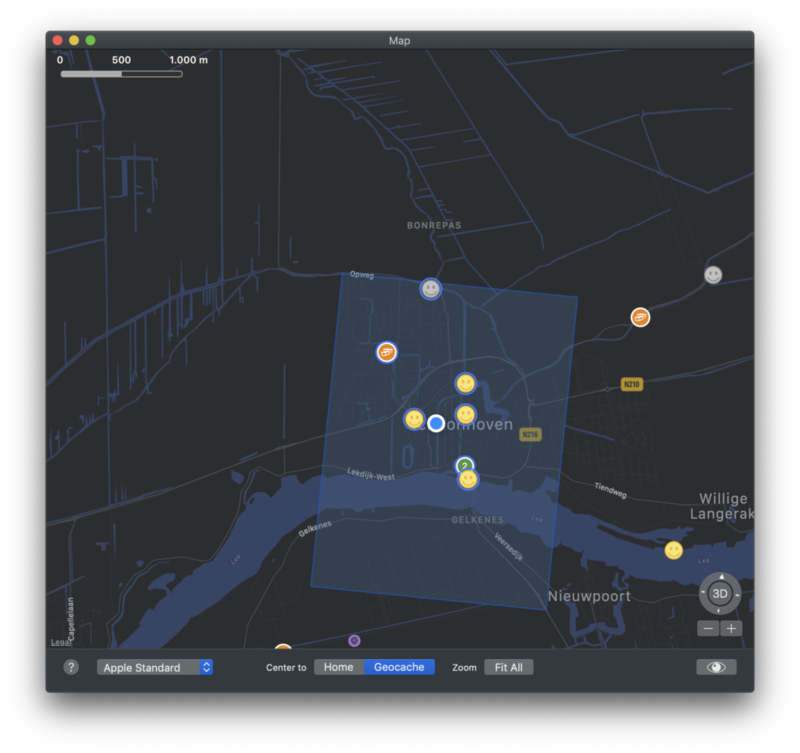 After a few days of hard work Apple Maps in iCaching is nearing completion. If you want, you can download a beta version and let me know what you think of it. Last month I released iCaching 6.0 (and two smaller fix updates) featuring a vastly improved logging window. 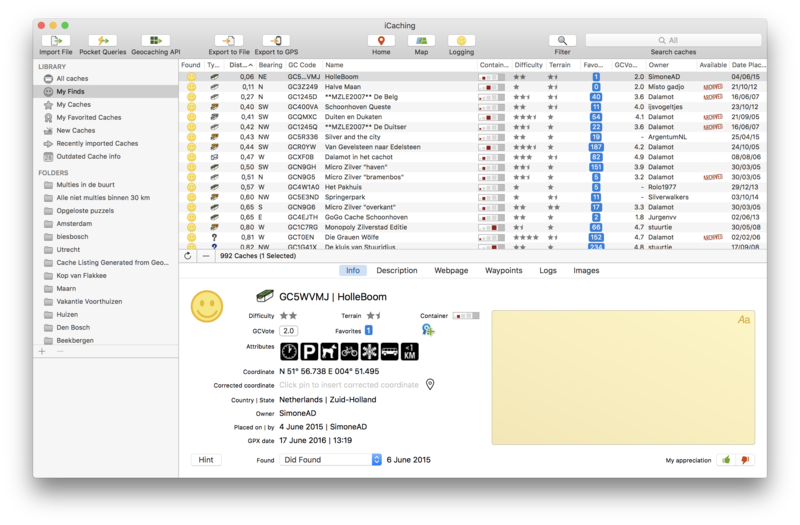 It’s now easier than ever to log all your geocache finds (and yes, also your DNFs :-). Start by importing the finds log from your GPS (most paperless GPS have such a file), or by dragging geocaches you found into the list. Edit your logs with a nice description and the right log type. You can edit multiple logs at the same time by selecting multiple logs in the list. Add pictures to your logs on the Images tab. 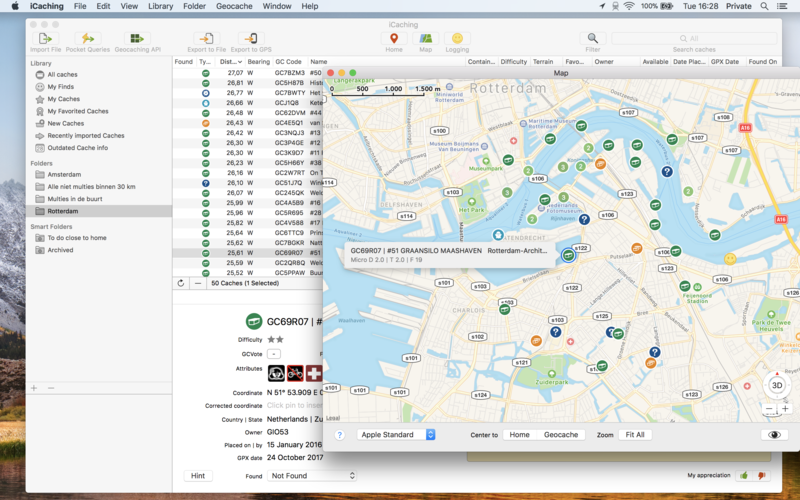 And conveniently log your travelbugs in the Travelbug tab. There you see the TBs available in the cache you visited, to log them as ‘discovered’ or ‘grab’. And you also see the TBs in your inventory, to log them as ‘visited’ or ‘dropped’. You can also log as ‘auto visit’ and the TB will automatically visit all the other logs in your list. Next to the logging feature, I also improved the way to import your found and owned caches into your library with two items in the new Library menu. So I hope you all enjoy (i)Caching! Yesterday I released version 5.7 of iCaching. Big new feature is the Pocket Query notification. iCaching lets you know when a new pocket query is available for download. And you can download it straight from the notification, without going to the pocket query window. Furthermore we refreshed several parts of the application with a new icon design. Several users contacted me reporting not to be able to log in to the Groundspeak API from within iCaching. I started an investigation, but even an older version of iCaching (that did work for sure previously) cannot log in any more. So it was not a code change on iCachings side that broke the login. Currently I’m in contact with Groundspeak to solve this problem. The friends at Groundspeak were able to figure out that the issue is related to login and user language. They are working on a fix. In the meantime there is a workaround: temporarily change your user language in your Geocaching account to English. Then login in iCaching and after that you can change your language back to whatever you want. This message is a bit late, but in the meantime version 5.5 went live. 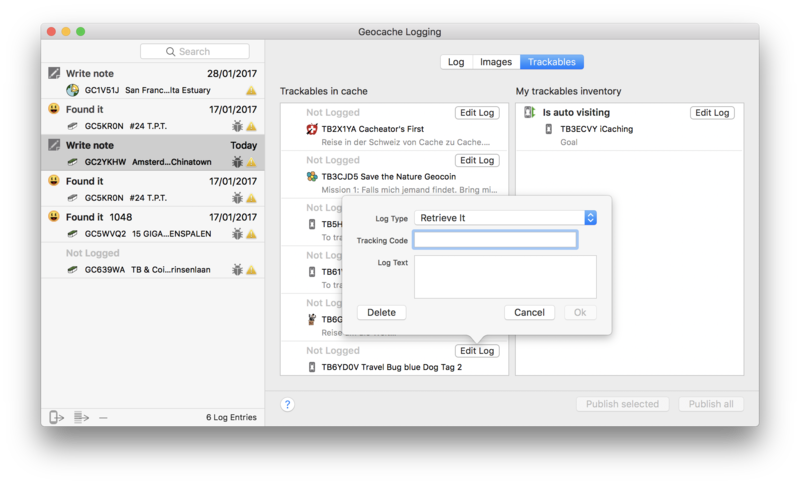 This version has a completely revamped logging window, and adds the ability to log trackables along with your cache logs. When preparing the logs, it keeps track of your inventory. So if, for instance, you log a trackable as ‘Retrieved’ from the first cache log, you can log it as ‘Visited’ in the second log. This was THE most asked feature, so we hope you’ll enjoy it! Adding and removing images to and from a cache log has been vastly improved too.